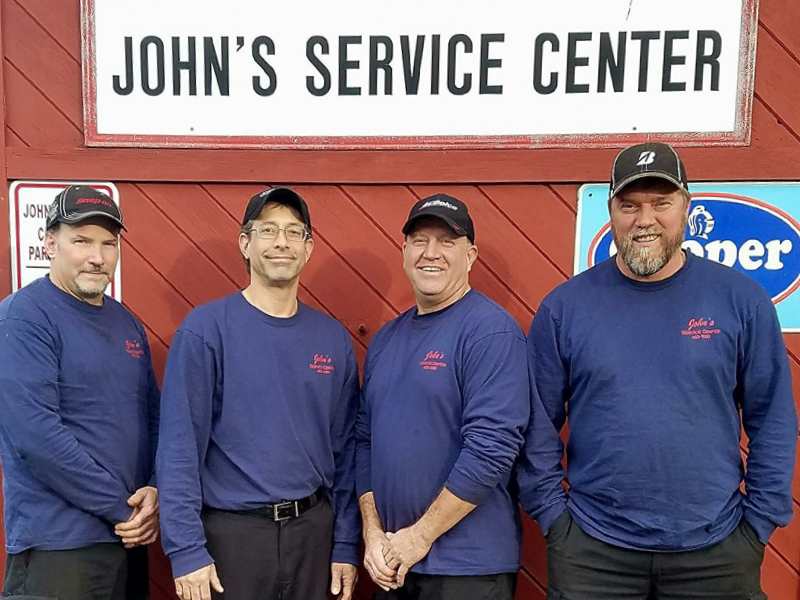 John's Service Center has been serving East Syracuse automotive owners for over forty years! Whether another shop fails you, or you just don't have the time, we can accommodate your car and give you piece of mind! Our years of experience and extensive automotive knowledge base give us an advantage over other mechanics. We accurately diagnose and repair your vehicle and rid you of any worries. Better yet, we back our parts and labor with a minimum guarantee across all services. Reliable service you can count on! Familiar faces you trust! We back our parts and labor with a 1 Year/12,000 Mile guarantee. These are a few of the major safety components found in every modern vehicle. Routine upkeep on your braking system helps reduce disatrous consequences and costly repairs down the road. Every component in your vehicle relies on every other component performing at its best! Regular maintenance helps prevent breakdowns and extends the life of your car. Did you know your car can talk? Check Engine Lights are one of the best ways your car has to talk, and we know how to listen! Knowing your car's On-Board Diagnostics is the first step in making that pesky light go away. Oil is the lubricant that keeps your engine working prime. 3,000 miles used to be the standard oil change interval; but nowadays every car is different. Thanks to an up-to-date auto knowledge base, we know the viscosity and blend you need, when you need it. Just one winter storm in Syracuse with bald tires and poor tread is enough to make any one reasses their tire choices. Whether the tire you need is an all-season, winter, off-road, performance, passenger, or any of the alternatives, we help you make an educated decision based on the ratings and qualities of each. When your car breaks down, roadside safety is nothing to take lightly. Getting you and your car to a safe spot as quickly as possible is the number one priority in any breakdown or accident. In a fender bender? Call John's Service Center! At John's Service Center you're not getting a one and done quickie. What you're getting is a dedicated team of ASE (National Institute for Automotive Service Excellence) Certified Mechanics. We don't just work on cars, we know cars. We offer a rate well below most dealerships and franchises because we know that your money is hard earned. Your dollar deserves the same respect that you do. The time and effort you put forth to earn it means something to us. We'd rather take home your respect than a few extra bucks. We get it. We're human too. That's why we're happy to open our doors and invite you into the service bay. Our labor rate doesn't mean a bank run, it means we're putting as much back into the shop as we can. Our gears are always turning! The parts used in shop are covered with our 1 Year/12,000 Mile guarantee. Some work done and parts used are covered even longer! Customers are more than welcome to bring in their own parts to use. This may be the case from time to time due to rarity of parts needed or length of time to recieve the part. However, any part provided by the customer is not covered by our guarantee. Don't hestitate to call us any time! Or just leave us a message here...We promise to get back to you as soon as possible. NO GAMES. NO BULL. PERIOD.